Stan's focus going forward will be other media - "new fields for Marvel to conquer in film, TV, books, and you-name-it-we'll-do-it!" Big news, and the end of an era. Revisions in the Comics Code allowed Marvel to expand its line into horror comics. These characters were initially stand-alone comics that didn't necessarily have anything to do with the Marvel Universe, but they were quickly incorporated. The CCA revisions on drug depiction also allowed Marvel to focus more on street-level crime. 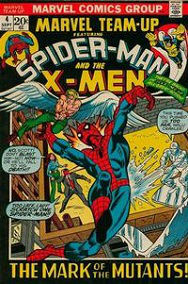 In the past the sort of non-super crimes heroes like Spider-Man and Daredevil dealt with were robberies and muggings. Now they can bust drug dealers and the like as well. This change also allowed for the creation of characters like Luke Cage. 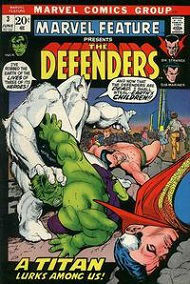 Creator notes: Gerry Conway is writing a lot of books. 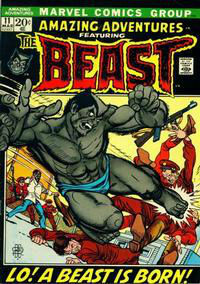 Steve Englehart begins writing the Beast solo stories in Amazing Adventures. Barry (Windsor) Smith pops up on pencils here and there. Bill Everett returns to the Sub-Mariner. Notable events: Marvel attempted a short lived female focused line this year, which included three comics: The Cat, Shanna the She-Devil, and Night Nurse. A positive attempt was made to ensure that the comics were produced by female creators (even if it meant recruiting the wives or girlfriends of male Bullpeners to do it).